She teaches a blend of Hatha, Ashtanga and Iyengar Yoga. The sequence is a blend of cardiovascular endurance, muscular endurance, and flexibility training. It is an open level class, so any level yoga practice you have is welcome. She has worked as a personal trainer in New Jersey and Dubai and continues to learn new exercise techniques that are in the fitness field to keep up to date. The approach to any yoga training is to start with the breath and let the body move accordingly. 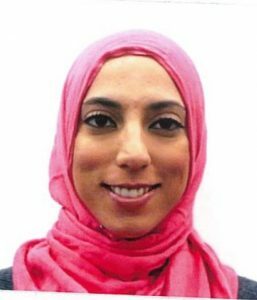 She also has experience in body composition analysis and performed many different body composition tests on Muslim Women at Kean University in 2015. Sara completed a Bachelors degree in Biology at Fairleigh Dickinson University in 2012 and a Masters program in Exercise Science at Kean University in 2015.